The official New Hampshire Reports contains current opinions decided by the Supreme Court of New Hampshire. 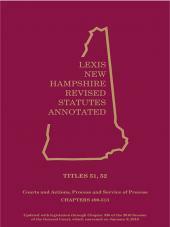 Your subscription to the New Hampshire Reports Current Case Service gives you access to the law as it is being made. All points of law in each opinion are fully headnoted with all relevant points of law by our attorney editors and reviewed by the reporter of decisions of the Supreme Court of New Hampshire. Each pamphlet contains a series of useful tables, including a table of cases, a table of parallel citations, and a table of statutes cited or construed.